The olive branch is an international symbol of peace. And while peace can develop from nations deciding to set aside their differences, historically, peace is as likely to be the outcome of conquest. 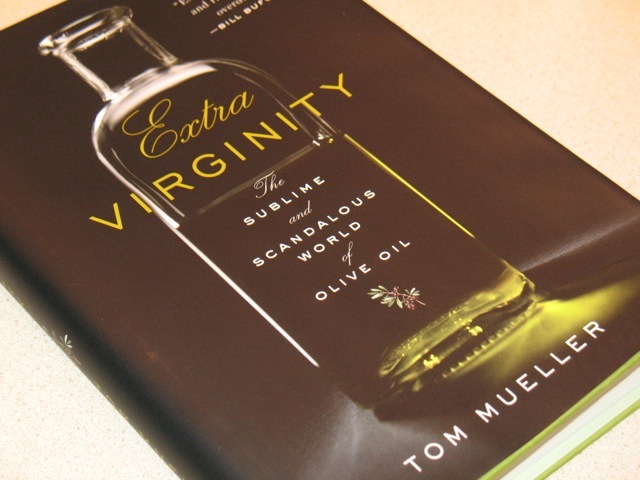 The history, present and possibly the future of olive oil itself is just as two-sided, as skillfully revealed in Tom Mueller's Extra Virginity: The Sublime and Scandalous World of Olive Oil. While many of us see olive oil as a healthful and flavorful all-purpose cooking oil with a golden-green glow produced in pastoral Italian villas, Mueller's examination uncovers its scandalous underbelly. Historically, olive oil has played important roles in Mediterranean civilizations going back as far as the Greeks and Romans. Its current dark side is reflected in its past, where olive oil has been used in both sacred religious rituals and witchcraft. As interesting as the history is, it's the modern issues that most interested me. Sure, extra-virgin olive oil is amazing stuff, and Mueller spends plenty of time traveling the world to meet with true believers who produce high-quality olive oil as a labor of love. But he also shows how global market forces, seeking to satisfy a growing a demand for extra-virgin olive oil, are pushing some less scrupulous producers to pass off lower quality olive oil and even olive oil adulterated with vegetables oils as extra-virgin olive oil. The problem is so pervasive and longstanding that many consumers aren't even aware of what extra-virgin olive oil should taste like. They've been buying inferior product for so long and don't know the difference. Furthermore, many consumers might not even like real extra-virgin olive oil if they tried it, given its intense combination of fruity, bitter and peppery flavors--the last of which will make you cough if you ingest at least a spoonful straight. Mueller tackles these and other types of deviousness with first-person accounts of his meetings with large-scale producers, independent farmers and government officials. He also reveals how much marketing plays into our perception of olive oil. That bottle with the sunny Italian villa on it? More than likely, the stuff in the bottle was from olives grown and processed in Spain, which accounts for an increasing portion of olive oil bottled in Italian and then sold with no mention of its true Spanish heritage. With lax international standards and governments unwilling to enforce what standards they do have (The U.S. Food and Drug Administration, for example, has taken a pass, since poor quality olive oil, although a rip-off, does not generally pose a health risk), buyers have to be particularly saavy about knowing what they're buying and who they're buying it from. In an appendix, Mueller outlines resources and tips for choosing good oil. His journey eventually brings him to California, a minor olive oil producer globally, but a potentially important one in creating a new world order for quality oils, given the ideal agricultural conditions of California combined with the sizable and growing U.S. market for olive oil. There, a small number of producers, particularly in northern California, are putting a lot of care and energy into the burgeoning domestic market for quality extra-virgin olive oil. My hopes were dashed though when I read this ominous line: "The United States of America is an oil criminal's dream." Despite the good example being set in northern California, apparently in southern California, trouble is brewing, with Mueller describing Los Angeles as a hub for oil fraud where soybean, seed and cottonseed oils are being blended with low-grade olive oil and sold as extra-virgin. It seems the fraud of the old world is alive in well in the new one. It's no surprise then that in the epilogue of Mueller's book he sees a crossroads: "Are we witnessing a renaissance in olive oil, or the death of an industry?" Certainly, good consumer education, such as this book provides, is an important step in helping to ensure we realize the former. I know how much you enjoyed this book and your review reflects that. Who knew the history of olive oil was so fascinating? Nicely done.